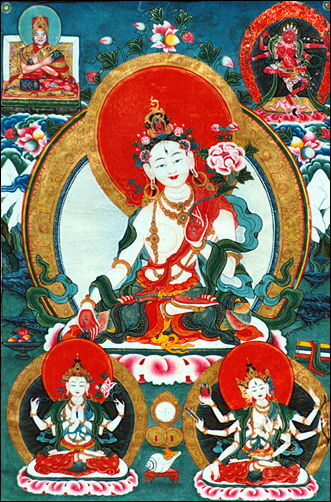 The enlightened women or female figures named below all come from Vajrayana or "Tibetan" Buddhism, the school of Mahayana which originated in India and later moved to Tibet and the other Himalayan countries. Hence, most figures are identified first by their Sanskrit name, with the alternate Tibetan form appearing in parentheses (when it is the other way around, i.e. Achi Chkyi Drolma, Machig Labdron and Palden Lhamo, it is because their practices developed or were practised principally in Tibet). Pictures of the different deities can be found on the website Himalayan Art Resources.